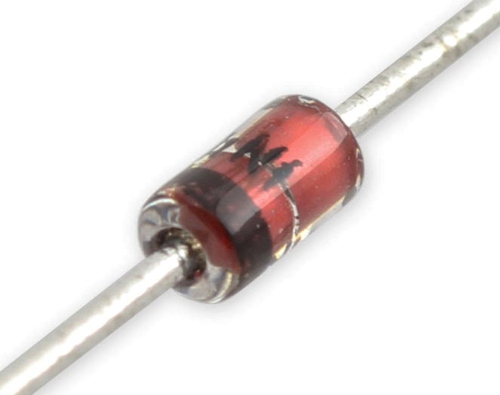 A glass encapsulated Zener diode. By choosing an appropriate voltage diode (24V) and 100k limiting resistor, it’s possible to get a noise signal of ~1.1Vpp measured @ 20MHz bandwidth. This can be increased to ~1.6Vpp by the addition of a single FET transistor voltage follower acting as buffer. When sampled by an off the shelf Arduino Uno’s analogue to digital converter (ADC) at the default 10kSa/s, at least 48kbit/s of entropy can be harvested. This rises to Ybit/s at an increased sample rate of 44kSa/s. Not bad. And certainly oodles faster than /dev/random (which can be awfully slow).